Our family is growing in more ways than one! My husband and I have been talking about adopting since our miscarriages over fourteen years ago. Occasionally, the topic would resurface, but we always had some "logical" reason in our way. In the spring of 2010, adoption found its way back into our conversation. This time, we couldn't ignore the longing placed on our hearts. 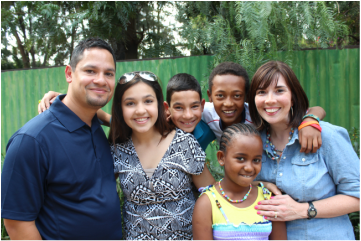 We sought out godly counsel and prayed about it for months.God’s plan was confirmed over the course of the summer and we've been working toward an international adoption since. Our biggest question was how in the world will we ever finance such a thing? It seemed impossible. God’s message to us the whole way was TRUST IN ME. It’s HIS plan. He has been so good to us. He is Jehovah Jireh, the great provider. I have so many amazing stories to share -many from funding alone- all in God’s perfect timing. And it makes perfect sense- it is, after all, His original plan. This whole process has been a bittersweet reminder of how He adopted us into His family- at a much higher cost than our inconvenience and stretching of pennies. We have had more opportunities to share the truth than ever before, and we have taken each one. Early on, we wanted to know who needed a home most in the world. We couldn't ignore the fact that 43 million of the world’s orphans live in sub-Saharan Africa-5 million in Ethiopia alone. We were led to America World Adoption Agency’s Ethiopia program. We’re currently waiting to adopt two Ethiopian children into our family. Heaven help us! Our twelve and thirteen year old children have been a blessing to have during this process. With hearts so innocent and passionate, they’re our sweet reminders of God’s loving kindness. Our whole family is growing. Yes, physically, we’re about to double the number of children in our home. Spiritually, we’re being stretched in ways we never could have imagined. Our international adoption has caused us to regularly consider our own adoption as children of The Living God. We’re reconsidering the way we live in light of the hurting world around us and stepping out in faith, beyond what once kept us comfortable and safe, in order to make a difference. We are learning to completely rely on Him. In the meantime, we’re waiting and praying, knowing that our Ethiopian children are waiting for us on the other side of the globe; knowing that our God loves and cares for all of us, and that He has a plan to use these circumstances for the good of those who love Him. The very God who gives us each breath is breathing life into this family. When we stop and truly contemplate His magnitude, we are completely overwhelmed and humbled. We couldn't make it without Him. We're excited to have you join us on this journey.